While the mining and exploration industry waits for an upturn in commodity markets, abundant opportunities exist in the Nordic countries for those with an eye to the future. In its annual review of the region, E&MJ looks at current developments. As E&MJ noted in its report last year on mining and exploration activity in the Nordic countries (October 2014, pp. 30–36), “no one questions that they have an enviable endowment of prospective mineral deposits.” The review also pointed out that exploration companies and producers with limited capital resources had been having a fairly tough time over the past year or two—with the perspective in 2015 being that things have not changed much. Indeed, from a number of viewpoints, mining and exploration within the region are still struggling, with the iron-ore sector particularly vulnerable to competition from lower-cost production from the world’s major suppliers. On the flip side of the coin, current weak market conditions have in no way damaged these countries’ reputation for being among the best places in the world to establish operations. In addition, the individual geological surveys are continuing with their fundamental appraisal of the mineral resource potential across the region, surveying and identifying prospective possibilities for the commercial sector to pick up and evaluate in due course. Not surprisingly, the Nordic countries took a share of this hit, and what is more probably took a higher proportion of the hit than, say, copper and gold prospects in Latin America and Eurasia. Nonetheless, SNL reported that Sweden still managed to attract some $70 million in exploration funding during 2014. Regardless of the slowdown in exploration activity on the ground, the Geological Survey of Finland (GTK) recently published a number of reports on the country’s potential for gold, copper, zinc and phosphates. For example, the organization has evaluated bedrock-hosted orogenic gold resources to a depth of 1 km, and believes there are 32 areas that could contain undiscovered gold deposits of this type. In terms of deposit numbers, the GTK expects that around 90 exist containing, at a 50% probability level, at least 750 metric tons (mt) of gold. “Comparison to the known resources indicates that about 70% of the orogenic gold endowment in Finland occurs in poorly explored or yet undiscovered deposits,” the GTK explained. The GTK has been undertaking this assessment of undiscovered resources within Finland since 2008. It published its estimates of undiscovered gold resources in layered intrusion-hosted PGE deposits in 2010, and in VMS, Outokumpu and porphyry copper deposits in 2014. Its work to date suggests that undiscovered gold resources in all of these deposit types totals at least 1,366 mt. The organization’s evaluation of undiscovered copper and zinc resources in VMS, porphyry and Outokumpu-type deposits identified 42 areas within the country that offer the potential for discoveries to be made. Potential resources total some 3.7 million mt of copper and 1.8 million mt of zinc, the GTK said, with substantial proportions of the resources held in all three of these deposit types occurring in areas that remain poorly explored. The GTK noted that the black shale-hosted Talvivaara deposit in eastern Finland remains the country’s single most important known copper-zinc resource. VMS-type deposits hosting zinc are mainly found in central and southern Finland, and Outokumpu-type deposits in the east of the country, while it believes that most of the undiscovered copper resources lie in porphyry-style deposits in central and southern Finland and in mafic-ultramafic intrusion-hosted nickel-copper-platinum group element deposits in the north. As well as hosting metals production, Finland is also the European Union’s sole phosphate producer. In the first publicly available survey of the mineral, the GTK estimates that resources held in apatite-rich deposits could be as high as 2,400 million mt at an average 10% apatite grade. It is currently undertaking a more detailed evaluation of some of the areas identified, involving both geophysics and drilling. And the GTK is keen to point out Finland’s already-established potential to host platinum-group metal deposits. Layered intrusives dated to 2.4 Ga contain huge pgm potential, the organization has stated, citing the example of Gold Fields’ Arctic Platinum project, which has reported resources of 17 million oz in low-grade reef and contact-type deposits. The GTK pointed out that known deposits are palladium-rich, with a typical 4:1 Pd/Pt ratio. 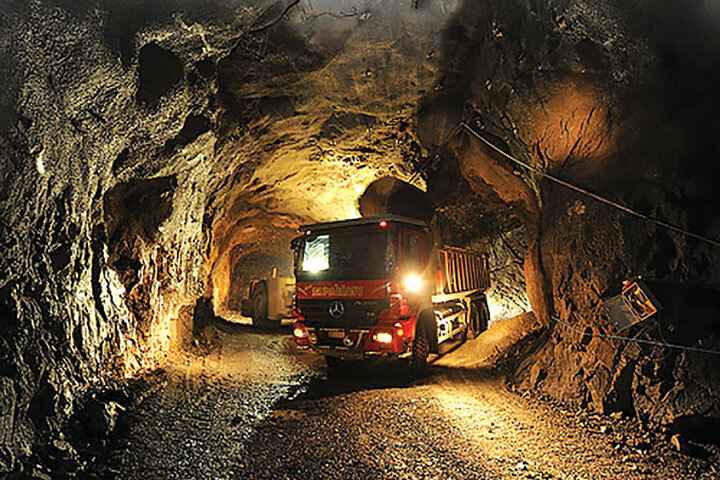 The big hitters in Finland’s mining industry returned positive results for 2014, with both Agnico Eagle and First Quantum Minerals reporting higher production than in 2013. By contrast, Talvivaara Mining’s year ended in financial meltdown, with the company’s operating subsidiary declaring bankruptcy. Agnico Eagle’s Kittila mine produced 141,742 oz of gold last year, with the company predicting 185,000 oz in 2015 as the effects of the recent mill expansion are fully realized. The mine has a 4.5 million oz proven and probable reserve, to which there is the potential for adding further resources once the company has evaluated the nearby Kuotko deposit. Initial indications are of a 170,000-oz resource there. The mill expansion, completed about six months ahead of schedule, upgraded the grinding, flotation, oxidation and cyanidation circuits. Agnico Eagle is now sourcing additional feed from both increased ore production underground and stockpiles, while the Kuotko prospect also has the potential to supply the plant from an open-pit operation in the future. Aside from its work at Kuotko, the company has extended the resource depth in the Suuri Trend, which hosts the Kittila deposit, with a 10-m-wide gold-bearing intersection 1,550 m below surface. It has also identified the possibility of a new parallel lens of mineralization 150 m away from the main ore zone at a depth of around 1,300 m, within the same host structure. Meanwhile, First Quantum reported higher production at its Kevitsa mine based on improved plant availability, throughput and copper recovery—the plant operated at 120% of its nameplate capacity. The operation produced 6.7 million mt of ore during 2014, from which it recovered 17,535 mt of copper, 9,433 mt of nickel, 12,844 oz of gold, 34,090 oz of platinum and 25,990 oz of palladium. First Quantum also reported its first full-year results from Pyhäsalmi, acquired with Inmet Mining in 2013, as being 14,304 mt of copper, 19,762 mt of zinc and 841,000 mt of pyrite from 1.38 million mt of ore milled. Output from the underground mine was affected by the workings running into poor ground conditions, with the company accelerating its development program as a result in order to access alternative ore sources as fewer stopes were available. The problem has continued into 2015, with the company focusing on increasing the volume of tailings backfill sent underground to reduce dilution and improve stope stability. Having operated since the start of 2014 under a process of restructuring, Talvivaara Mining finally admitted defeat in November when its operating subsidiary, Talvivaara Sotkamo, was declared bankrupt. In the nine months to September, the innovative leaching operation produced 8,363 mt of nickel and 16,189 mt of zinc, compared to 8,662 mt of nickel and 17,418 mt of zinc in 2013. Commenting on the situation as the company published its 2014 results, CEO Pekka Perä explained, “Despite of all the hard work, technical success and intense negotiations by the Talvivaara team, the company had no option but to file Talvivaara Sotkamo in bankruptcy in November 2014. As a result, the nature of the company’s business changed radically from operating a world-class mine to renting operational assets and selling services to the bankruptcy estate. “One of the biggest hurdles for new investors was the environmental permitting situation as the existing permits did not allow environmentally safe operation of the mine,” Perä went on. “The new environmental permit decision received in April 2014 made the situation for refinancing of the operation even worse. “All year we expected to receive a resolution for appeals submitted in June 2013 regarding the water release permits only to be informed, after almost a year and a half of waiting, that the administrative court will combine the appeals with appeals submitted for the new environmental permit granted 12 months later. This seriously undermined the company’s possibilities for refinancing,” he stated. With the company continuing in its search for a way of recovering the situation, in March, a U.K.-based investment firm, Audley Capital, offered a joint acquisition of the mine with the Finnish government. This approach subsequently foundered, but in June, the government allocated a further €112 million to assist the state-owned special-purpose company, Terraframe, to take over the operation. Rehn added that a complete shutdown of the mine should be avoided, since it could take seven years and cost the government €300 million. In August, an agreement was reached for Terrafame, state-funded to the tune of €209 million ($228 million), to buy the mining assets from the bankruptcy estate with the aim of restarting operations in September. 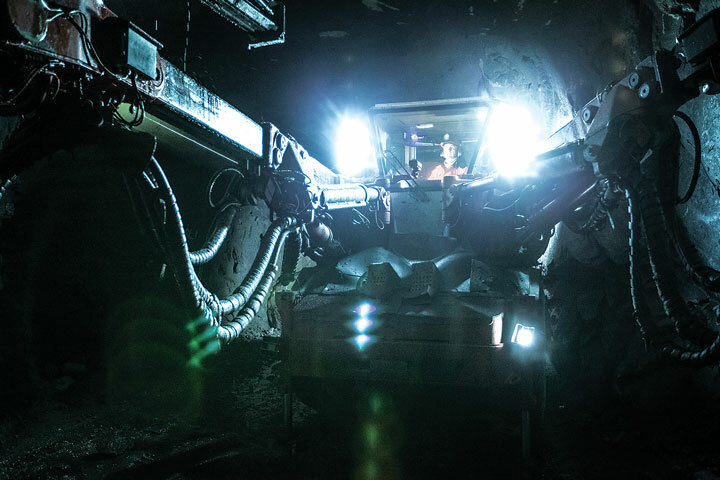 Talvivaara Mining also agreed with Terraframe to continue to provide administrative and technical services and to lease some critical machinery and equipment. Meanwhile, the search continues for new investors, with the government considering closing the mine if none can be found in the next two years, Reuters reported at the time. In September 2014, Outokumpu celebrated the 50th anniversary of its decision to begin mining the Kemi chromite deposit. The operation was actually commissioned in 1967, with ferrochrome production starting the following year. The only chromite mine in the European Union, today, Kemi has an output of around 2.4 million mt/y, feeding the company’s Tornio ferrochrome plant—where a project to double capacity was completed at the end of last year. Proven reserves are around 50 million mt with a further 98 million mt in resources. 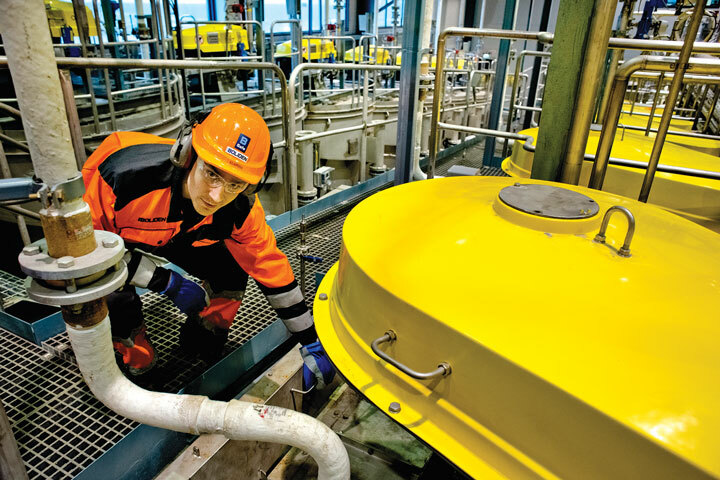 Finland’s other large tonnage mineral producer, Yara, operates the Siilinjärvi apatite-based phosphate mine, with an annual output of some 946,000 mt of ore. The company also has the rights to the Sokli phosphate deposit, close to the Russian border in northeastern Finland, which it has held since 2007. Both deposits are carbonatite-hosted, although Sokli has substantial resources of softer, weathered mineralization. An output of around 1.5 million mt of phosphate has been mooted, with Yara at one stage investigating the possibility of shipping its ore across the border for concentration in an existing plant at Kovdor in Russia. While this would reduce Yara’s capex requirements, it has yet to commit to the project, which lies in an environmentally sensitive region of the country. Of the 1,031 places listed by UNESCO as World Heritage sites, just 15 relate to places associated with mining and minerals. 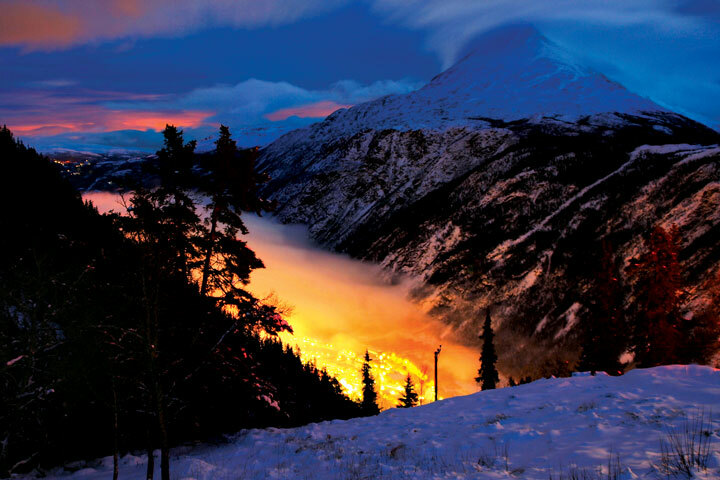 Earlier this year, the Rjukan-Notodden district in Telemark, northern Norway, became the most recent addition to the list, celebrating the technology that provided the foundation for Norsk-Hydro’s development as a fertilizer producer. The district joins the former copper-mining towns of Røros in Norway and Falun in Sweden as the Nordic countries’ mining-related World Heritage sites. Others around the world include Rammelsberg (silver) in Germany, Almadén in Spain and Idrija in Slovenia (mercury), the Wieliczka and Bochnia salt mines in Poland, Blaenavon (coal and iron) in Wales, and the mining town of Sewell, near El Teniente in Chile. Having produced 5.9 million mt of alumina and 1.96 million mt of primary aluminum in 2014, Hydro added to its capacity at the end of the year when it bought Rio Tinto Alcan’s 50% stake in the 180,000 mt/y Søral smelter in western Norway. Now renamed Hydro Husnes, it is the company’s fifth wholly owned smelter in the country. With one pot line idled since 2009, it has been producing around 90,000 mt/y of primary aluminum since then. 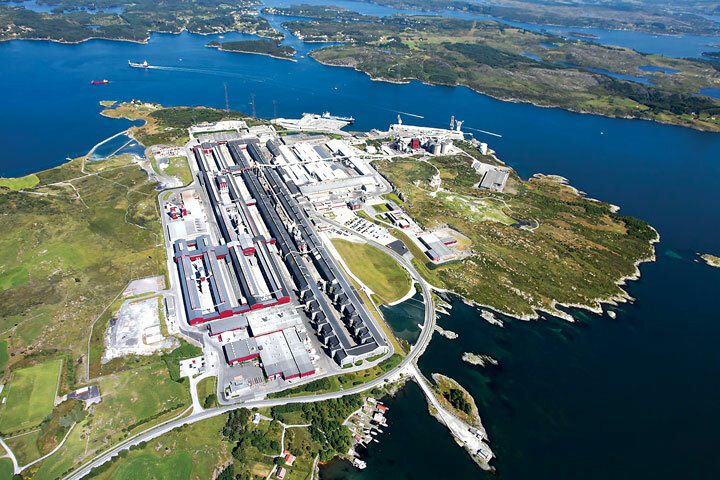 Hydro followed this in February with a formal investment decision to develop a full-scale, 75,000 mt/y pilot plant at Karmøy to demonstrate what it describes as the world’s most energy- and climate-efficient aluminum production. Total costs are estimated at some US$475 million, with the go-ahead dependent on the company securing power for the project. The technology aims to reduce per-kilo energy consumption by 15% compared to the world average, with the lowest CO2 footprint in the world. “The Karmøy pilot will be the largest investment in mainland industry in a decade, beyond oil and gas. The decision demonstrates our confidence in Norway’s future position in sustainable aluminum production in a global climate perspective,” said Brandtzæg. With world iron-ore markets having taken a hammering over the past 12 months, it is hardly surprising that the predicted shake-out of high-cost producers has begun. The upturn in prices that was such a strong feature of the market only four to five years ago triggered a surge in interest in new and reopened production capacity in both Sweden and Norway, as well as in Greenland. Today, only those companies with deep enough pockets are able to make ends meet, with juniors finding the going exceptionally tough. In December, Northland Resources filed for bankruptcy with debts of more than $650 million following failed attempts at refinancing, and within three months Dannemora Mineral finally succumbed, despite an earlier restructuring. Northland was operating the Kaunisvaara mine in northern Sweden, while Dannemora had successfully reopened the eponymous former SSAB mine in 2012. The producer with the deepest pockets, LKAB, reported the production of a record 25.7 million mt of iron-ore products last year, but achieved net profits of just SEK347 million ($44 million) on turnover of SEK20.6 billion. Since 2012, the company has achieved a 20% cut in production costs, mainly as a result of more open-pit capacity coming on stream, and it has a SEK700 million cost-reduction target for this year. 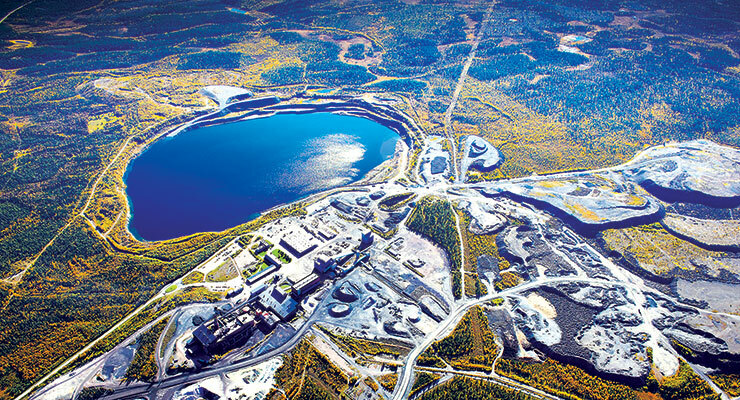 In April, LKAB finally received consent to resume mining at the Leveäniemi open-pit mine, part of its Svappavaara complex. Per-Erik Lindvall, a senior vice president for the company, noted at the time that it had submitted the first application for the Svappavaara field in 2008. “Now, seven years later, we have permits for operating all three mines,” he said. LKAB plans to produce some 12 million mt/y from Leveäniemi, which has reserves of 115 million mt at 46.8% Fe, and is open at depth. Meanwhile, Northern Iron reported a 14% increase in ore production at Sydvaranger (northern Norway) during 2014, reaching 6 million mt, with concentrate output up 18% to 2.3 million mt. Cash operating costs fell from $90 to $72/dmt. The company has put on hold its earlier plans to double concentrate production capacity, and has been involved in ongoing discussions over restructuring its sales contracts, debt facilities and debt servicing commitments. Having officially inaugurated the expansion of its Garpenberg mine in August last year, two months later Boliden added Finland to the list of countries where it operates mines with the finalization of its $95 million purchase of the Kylylahti copper mine from Altona Mining. Opened in 2012 and with reserves to support production until 2021, Kylylahti has a capacity of 650,000 mt/y of ore, producing zinc, silver and gold as well as copper, and had already been supplying concentrates to Boliden’s Harjavalta and Kokkola smelters in the country. Two months after that, in December, Boliden opened its SEK250 million silver-recovery plant at Kokkola, with the aim of producing 25 mt/y of silver in concentrates for sale to refineries elsewhere. With a production capacity of 315,000 mt/y, Kokkola is the second-largest zinc smelter in Europe. “This new process is of great importance for Kokkola,” said the plant’s general manager, Jarmo Herronen, noting that silver concentrate will now be one of its most valuable byproducts. The event at Kokkola coincided with Boliden celebrating its 90th anniversary, the company having been founded after the discovery of the Fågelmyran gold deposit on December 10, 1924. “Over the course of these 90 years, we have developed a unique knowledge base when it comes to exploration, mining, smelting and leaching processes,” stated CEO Lennart Evrell. Another of the company’s smelters is now being expanded, with a NOK350 million ($43 million) investment at Odda in Norway to increase capacity from 170,000 to 200,000 mt/y by late 2017. Boliden has also launched an independent nickel-smelting business, buying concentrates and selling matte to refineries. It has recently been toll-smelting nickel concentrates at Harjavalta, but has decided on the new strategy to bring its nickel business closer into line with its copper and zinc smelting activities. In the gold sector, Sweden’s largest primary mine, Björkdahl, changed ownership yet again in September 2014 with the buyout of the previous operator, Elgin Mining, by Canadian company Mandalay Resources. The mine has produced over 1 million oz of gold since opening in 1988, with both open-pit and underground operations. According to Mandalay, this is a classic high nugget-effect deposit, with the company’s strategy being to increase the mill-feed grade with selective mining and sorting. In their annual report to the Greenland parliament, the government ministries responsible for mining-sector administration noted that 2014 was a good year for exploration, with several promising projects moving closer to operating status, and the start of construction at one new mine—at True North Gems’ ruby-sapphire deposit near Qeqertarsuatsiaat. Ironbark Zinc continued with its evaluation of the Citronenfjord prospect in far northern Greenland, and in July announced a new high-grade intersection at its Mestersvig zinc prospect, close to the old Blyklippen mine. In all, six mining licenses are now in force or under application, the report noted. Minerals targeted include zinc, molybdenum, anorthosite, iron ore and rare earths. In January, one of China’s largest coal and iron-ore importing companies, the General Nice group, acquired the Isua iron-ore project from the administrators of London Mining, and has since been evaluating its potential. Meanwhile, Greenland Minerals and Energy is close to completing the studies needed to submit a mining license application for its Kvanefjeld rare-earths-zinc-uranium project, which it expects to do early next year. While Greenland can hardly be considered a bellwether for mining in general, the fact that companies with a specific focus are continuing with their projects in the face of financial adversity speaks volumes for their resilience, and for the quality of the resources. In this context, the same can well be said for the rest of the Nordic region, much of which still remains underexplored. With its recent reports, the Finnish Geological Survey has highlighted what it believes the region’s endowment may be. It is now up to the industry to follow-up, and demonstrate the potential for a new era in Nordic mining.